Paul Mazursky in July 2007. 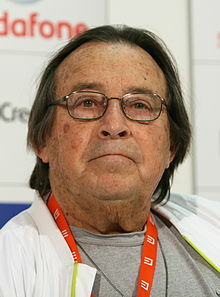 Irwin Lawrence "Paul" Mazursky (April 25, 1930 – June 30, 2014) was an American movie director, screenwriter, and actor. His best known movies were Bob & Carol & Ted & Alice (1969), Harry and Tonto (1974), An Unmarried Woman (1978), Moscow on the Hudson (1984), and Down and Out in Beverly Hills (1986). He was nominated for five Academy Awards: three times for Best Original Screenplay, once for Best Adapted Screenplay, and once for Best Picture. Mazursky was born in Brooklyn, New York City. His family were Jewish and his grandfather was a Ukrainian immigrant. He was married to Betsy (Purdy) Mazursky from 1953 until his death. They had two children. He was an atheist. Mazursky from a pulmonary cardiac arrest on June 30, 2014 at Cedars-Sinai Medical Center in Los Angeles, California. He was 84. ↑ Farber, Stephen (December 31, 2006). "A Night in Hollywood, a Day in Ukraine". The New York Times. Retrieved July 2, 2014. ↑ Leopold, Todd (July 1, 2014). "Paul Mazursky, 5-time Oscar nominee, dies". CNN. Retrieved July 2, 2014. This page was last changed on 20 March 2019, at 16:00.